Nature's Variety, makers of the Instinct® brand and Official Pet Food Partner of Best Friends Animal Society, announced today that its initial goal of 9,000 photos for its Long Live Pets campaign has been overwhelmingly surpassed with more than 25,000 photos of adopted and rescued dogs having been submitted by pet parents across the country. The photos are part of a nationwide campaign to raise awareness of the 3 to 4 million pets that are killed each year in America's animal shelters. Hundreds of the photos have been woven together to produce a groundbreaking, crowd-sourced short film that captures the joy of rescue dogs' initial journeys from shelters to their forever homes. 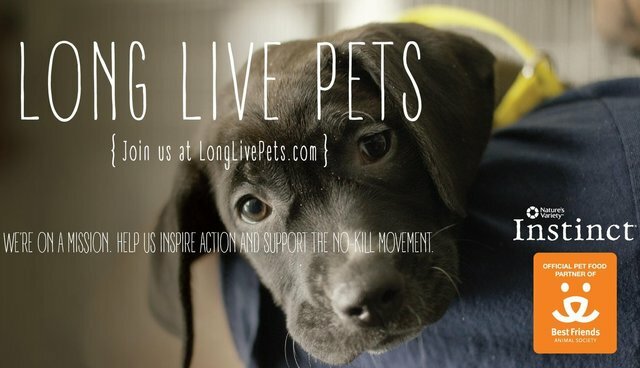 Pet lovers can go to LongLivePets.com to see the heartwarming final film along with a gallery of all 25,000 photos. The national broadcast premiere of the film aired April 17 between 9-10 p.m. EDT/8-9 p.m. CDT on the Nat Geo WILD network. "We set out with a goal of 9,000 photos to bring attention to the estimated 9,000 dogs and cats killed each day in America's shelters simply because they can't find homes," said Robert Bennett, Chief Marketing Officer of Nature's Variety. "However, we've been absolutely overwhelmed with the response from rescue-pet parents, who allowed us to almost triple that initial goal. Our company purpose is to empower people to transform the lives of pets, and it's been humbling and inspiring to see so many people participating in the Long Live Pets campaign and helping to raise awareness of the rewards of adopting a shelter animal." In addition to soliciting photos and underwriting the production of the film, Nature's Variety has given a cash donation to Best Friends and is supplying its Instinct brand dog and cat food to Best Friends' Animal Sanctuary in Kanab, Utah to help feed the 1,000 dogs and cats being cared for on the sanctuary grounds. Nature's Variety's overarching goal for this campaign is to bring more awareness to pets available for adoption and to inspire others to act. "We are grateful to our partners at Nature's Variety for leading this campaign that sheds light on the joy that dogs have as they are adopted out of shelters," said Gregory Castle, co-founder and CEO of Best Friends Animal Society. "Our hope is that this video will serve as an inspiration for others to adopt a shelter pet, volunteer, donate or spread the word about the millions of loving pets still waiting in shelters for forever homes." About Nature's Variety Nature's Variety is an independent company producing premium, natural pet foods, with headquarters in St. Louis and manufacturing operations in Lincoln, Nebraska. Nature's Variety produces pet food through two brands – Instinct®, the leader in raw pet food; and Prairie®, a balanced holistic line of food. The Instinct® brand includes Pride by Instinct®, Instinct® Raw Boost®, Instinct® Limited Ingredient Diets, Instinct® Healthy Weight and Instinct® Ultimate Protein™. Nature's Variety products are sold at local pet specialty retailers, Petco, PetSmart, veterinarian offices, and through online retailers, including Amazon.com, Wag.com, Chewy.com and Petflow.com. For more information about Nature's Variety, visit www.naturesvariety.com. For more information on Instinct®, visit www.instinctpetfood.com. About Best Friends Animal Society Best Friends Animal Society is the only national animal welfare organization dedicated exclusively to ending the killing of dogs and cats in America's shelters. A leader in the no-kill movement, Best Friends runs the nation's largest no-kill sanctuary for companion animals, as well as lifesaving programs in partnership with rescue groups and shelters across the country. Since its founding in 1984, Best Friends has helped reduce the number of animals killed in American shelters from 17 million per year to about 4 million. By continuing to build effective initiatives that reduce the number of animals entering shelters and increase the number who find homes, Best Friends and its nationwide network of members and partners are working to Save Them All®.